We're back from a trip to Kentucky and I'm exhausted! Had a fun time there with the kids. I love Kentucky's Cave Country. There's so much do there. In our four days there, we did two cave tours, went to a water park, visited an Australian-themed animal park, stayed on a farm where the kids fed the animals and gathered eggs, saw life-sized dinosaur replicas, watched deer grazing just feet from our hotel room, watched a wild west gunfight, took a cable car ride, wandered through a couple museums, rode go-karts, pet a kangaroo, fed exotic birds, went through a haunted house and more. And, more often than not, our trips turn out to be a bit Griswold-esque with something going wrong. One year our power steering went out as we were pulling into our hilly campground resort. Another time, our mini-fridge in the van killed the battery. Another time, our electrical system went haywire and kept blowing fuses, leaving us with no headlights as we maneuvered through hilly terrain in the middle of the night. Another time our air conditioning went out as we arrived on the coast with temperatures in the 90's. And on that same trip, I took off my wedding band and put it in the kitchen cabinet of our rental so it wouldn't lose it on the beach...well, an hour after our departure, I realized I'd forgotten it and contacted the resort. Housekeeping claimed it wasn't there. But, we've never had a serious injury on a trip. No one has gotten lost. No one has gotten sick. No lost credit cards. No car accidents. It's been minor stuff for the most part. We've always made it back home in one piece and always created lots of lasting memories. This trip was no different. Time to go doze and recover and I'll post more soon. I'm on a working vacation along with my husband and four of my boys. It's always nice to get away and fascinating to see new things and explore new places to write about. We left home about 36 hours ago and here's some of what we've experienced. The first six hours were spent on the road getting to our destination in Kentucky. Stop #1 was Cub Run Cave. It's only been open since 2006 after three years of preparation, including adding wooden walkways that were constructed by Amish craftsman. The formations were amazing. The boys were in awe. It was a nice start to the trip. We stopped for dinner at a little place called Nana and Papaw's and then went on to our accommodations for the evening. We stayed at Country Girl at Heart Farm Bed and Breakfast. We got checked in to the former Amish farmhouse and our hostess, Darlene, gave us the tour. As the sun was setting, we went out back and the boys helped her round up the chickens and get them into the hen house. In the distance, we could see the neighbors walking up their driveway and could tell instantly from the attire that it was an Amish family. Then we went down to the rec room for some pool, air hockey, foosball and game playing. There's also a large projection screen, craft area and playroom with lots of toys for young kids. The B & B opened in the fall of 2009 after a two-year project of renovating and constructing a 6,000 square-foot addition. This morning we woke to a table of fresh fruit and the smell of pancakes and sausage. (I'll post pics of what we had on the food blog my sister and I started - www.chicagofoodiesisters.blogspot.com.) After breakfast, the kids loved heading out to gather eggs and feed the horses. While the older boys were hesitant, my six-year-old couldn't have been more thrilled to reach into a nest and pull out eggs. My husband always says he should have been a farmer. He is a morning person who doesn't mind getting up at the crack of dawn, he doesn't mind getting dirty, he's an animal lover and loves the outdoors. He was in heaven and the boys were also loving it. After checking out, we went on to our next stop - the American Cave Museum and Hidden River Cave. On the way, my husband had to brake for a wild turkey crossing the road. We got to the museum just as a tour was starting. We rushed out to catch up, got down the stairs into the cave and my youngest let us know that he had to go to the bathroom - NOW. He and my husband went all the way back up to use the facilities and caught up just as the tour ended, so it was back up again. They were ready for a nap by the time we were done. The cave tour was interesting, focusing on conservation and recounting a massive clean-up effort that had to be undertaken for the cave to re-open in 1993. After the tour, we walked through the two-level cave museum that was full of exhibits on cave history and cave life. After we left, we walked around the corner to the Gallery Bakery. The kids got some cookies. They have a decorating station where kids can decorate plain sugar cookies. My youngest picked out a bat-shaped one and then decorated it with black and green frosting. He had a blast. Then it was on to Kentucky Down Under in Horse Cave. I have been there twice. Once in 1997 and again in 2004, but this was the first time for my youngest and my eight-year-old was turning one on our last visit, so it was all new to them. I love the place and couldn't wait to return to pet a kangaroo, feed the lories and visit the woolshed. The first time I was there itwas because I happened to come across an ad while planning a trip to Tennessee and we decided to stop since it was right off I-65. For anyone traveling south on I-65, I'd recommend it as a stop. It offers a great overview of Australia and the wildlife there and admission includes a tour of a cave on the property. P.S. The fudge in the gift shop is awesome! It was sweltering during our time there and we were happy to get into some air conditioning at our hotel, the Hampton Inn, just a couple minutes away. It's a modern, clean, tastefully-decorated choice for lodging. We took a dip in the pool and are now chilling out in our room. It's been a busy couple of days. Can't wait to finish the trip. I'll post some pics once we get home. Time for some shut-eye. There's another busy day ahead tomorrow. For some moms it's a quiet spa that offers a feeling of calm. For others it may be a relaxing day at the beach. Some may enjoy a cup of coffee in a quiet house while the kids aren't home. All moms have different ways of chillaxin and different environmental characteristics that induce a state of calmness. Call me strange, but for me it is Wrigley Field. Yes, the Friendly Confines. The home of the Chicago Cubs. I feel at home there. I can relax and put the rest of the world out of my mind when I'm there. I can go to a game with one of my sons and enjoy giving them some undivided attention. 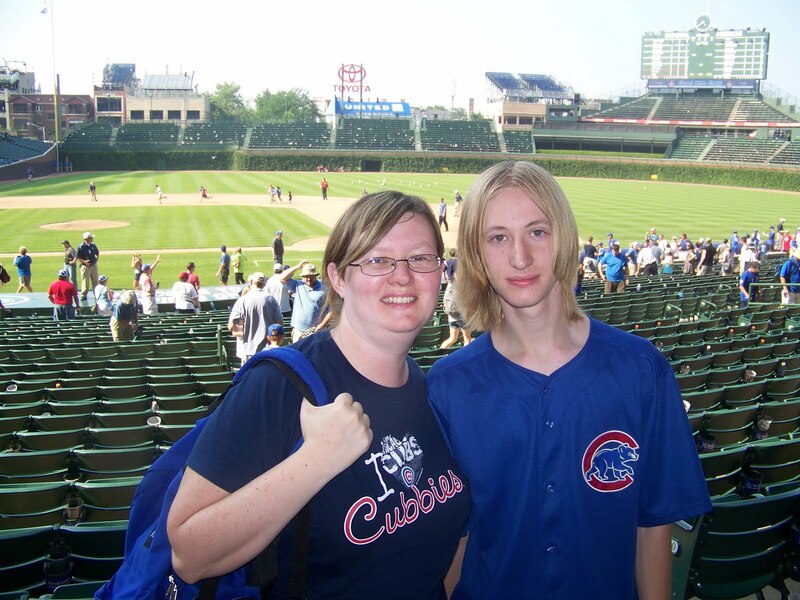 This past week, my oldest son and I attended a game. They lost. Hey, that's nothing new. It is the Cubs we are talking about. Losing is something they do more than winning. It's part of the tradition. Part of the curse - if you believe in that sort of stuff. Even though the game didn't end the way we would have liked (and let me add that a horrible call by the ump in the 8th inning cost them the game! ), it was a bonding opportunity for me and my son. We've been bonding through baseball since he was about 5. Now he's 17. In recent years, my sister, a season ticket holder has given me several sets of tickets each season so that I can take the boys to the games. It serves as birthday gifts and I get as much enjoyment out of it as my boys. We always have the same seats in the upper deck. Sure, you can get a better close-up look at things in box seating or a suite, but I love our seats. We are under a canopy, so if it happens to rain a little, we are covered. If it's hot and sunny, like it was on our last visit, we are shaded. I don't even have to lather on sunscreen for a trip there. There have even been games I've been at early in the season when there was snow coming down, but not a flake ever fell on us. 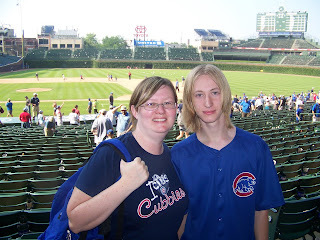 I also attend an early season game each year with my dad. It's become our baseball ritual. We always freeze our behinds off in April, but spring just wouldn't be the same without our annual trip to Wrigley. My oldest turned 17 in May and got his driver's license last month, so I'm seeing less of him these days. He's enjoying the new found freedom that comes with having a set of wheels. This will be his last year of high school. Who knows what's to come next year...more school, perhaps military service. I know our days together as we now know them are numbered. It makes it even sweeter when I'm able to be with him and be in my favorite place all in one day. Honor your country and your flag (as your stand for the National Anthem). Good guys sometimes finish last (a frequent lesson on this team). After the game, we went on try and get autographs by the players parking lot as we usually do, but as we were exiting, several of the players wives and children were entering for a special family event on the field, so we figured it would be a while before they came out. We split and went over to McDonald's for an ice cream cone. At the next table was an older, well-dressed African-American man with a large black case beside him. I listened in to his conversation with a couple ladies. He was a trumpet player. He may have been playing out on the street after the game, but he was really dressed a little too nice for that. He was wearing a suit and tie and it was about 96 degrees outside. He showed no signs of being out in the heat playing -- no wrinkles or signs of set on his neatly pressed suit. He told the ladies that he plays all over the area in different clubs. One lady said that her son also plays trumpets and she is always on his case to practice each day. He explained that he started playing late - at age 19. He assured her that she was doing the right thing by making him practice even if he complained. "If he's got talent, he's got to do it. You got talent, you got to use it," he said. He sounded so sweet and gentlemanly, I had to try hard not to tear up. Talented people always seem to tear me up -- whether it's a young child performing in a school play, an amateur giving a shot at karaoke or a musician playing in a club. Even outside the ballpark, there were more life lessons from a well-dressed old man carrying a trumpet case. You can have your spa or your high-priced coffee. I'll take a ball game any day. So I was thinking today about how much of my info. comes from FB. You know those "where were you when moments?" I was five years old watching the news in my living room when I heard Elvis died. I was in 7th grade language arts class when the space shuttle Challenger exploded. I was in the car waiting for my emissions test to be taken when I heard on the radio that the Gulf War had began. Nowadays, I seem to be in front of the computer on Facebook when I learn about breaking news. How did I hear about Osama Bin Laden being killed? Facebook. Charlie Sheen "Winning?" Facebook. The Blago verdict? Facebook. The Marc Anthony/JLo split? Facebook. I'm so excited that my new book is finally in print. I got my copies in the mail yesterday. I was on the phone doing an interview when someone knocked on the door and the dog started barking, so I excused myself for a minute and found a heavy box. I couldn't imagine what was in it since the only thing on order right now is a pair of sunglasses. Then I looked at the return address and realized it was from my publisher. A couple friends had pre-ordered and reported that they'd gotten their copy the day before. My last book was released almost 8 years ago today. It was delivered as I was in labor with my fourth son and getting ready to head to the hospital. 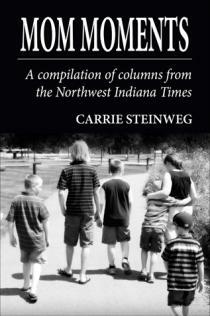 My latest book is titled "Mom Moments: A compilation of columns from the Northwest Indiana Times." It is a collection of columns I wrote for the paper from 2000-2010. My friend, MaryBeth Witulski shot the cover image for me. Last summer she did a photo session of my family at a local park and snapped this one of my and my five boys. I thought it would make a great pic for the book. Use code "Discount20" to get twenty percent off. Ah, it is summer. Supposed to be long lazy dog days, right? Summer days are fun, but so exhausting. And the sunny skies and having the kids around make me want to stray from my computer and housework and play. Yesterday was the last day of summer school and I'd wanted to sleep in, but woke with my mind racing with my mental to-do list that is getting longer by the day. One of the boys wanted to be at an early library program today, so I'll have to wake him soon. I'm almost done with a book I've been reading for three weeks. Hate to put it down, but there's work I HAVE to get done today!!! After that, I'm going to treat myself with some lazy days. I hope. Is it just me or does anyone else get that nagging feeling that I have to entertain the kids and plan and schedule things during the summer? Gosh, when I was young, summer meant heading out on your bike as soon as you woke up and spending the whole day out of the house, stopping inside only for meals. As the sun set all the neighborhood kids would hang out in front yards as we were supposed to be in when the streetlights came on. We'd squeeze in some games of "Ghost in the Graveyard" or "Red Rover" as the sun was setting. Doesn't seem to be that way anymore. However, I feel that left to their own devices, my kids would be content in front of the television playing video games from morning 'til night and we can't have that. So, I try to get them out to the park, the pool, the library, for ice cream and on other outings. Today will hopefully be a jaunt to the pool IF I get my work done!!! Better run!!! Two of my boys have been taking summer enrichment classes. My 9-year-old is in the "Latin Fiesta" class where he's learned Spanish, made a pinata, made maracas and learned some Zumba dance moves. The class ends tomorrow with a fiesta. My 7-year-old enrolled in "Summer Musical." I was so glad when he came home from school with the brochure and told me he wanted to sign up. I love to hear him sing. He has the sweetest little voice. And he has a great memory and has no problem getting the words to a song down. When he was in kindergarten, I took him to a meeting for the school's talent show. We'd recently gotten a Rock Band game and his favorite song to sing on it was "Eye of the Tiger." I brought a CD for him to sing along with. He'd sang it dozens of times at home, with lots of dramatic facial expressions and dance moves included. When he got to the talent show meeting, he was hesitant, but with a little coaxing got up and performed. Immediately after he was done, he begged me to go home. He seemed very uncomfortable with all the eyes on him. I couldn't get him to go back and perform no matter how hard I tried or how much I encouraged him. So, this year I was very happy that he was going to be brave enough to take the class knowing that he'd be singing in front of other people. For the past four weeks, the class has practiced for a performance of "Joust." He was to be a medieval knight. A couple times he came home from class complaining that the costumes or songs were lame, but overall, he seemed to enjoy the class. Earlier this week as I was driving him to school one morning, he burst into tears saying he didn't want to be in the play. He was afraid people would laugh at him or make fun of him if he got up on the stage. I assured him that wouldn't happen and tried to boost his confidence. He wasn't buying it. He sat in the car and sobbed for a good three minutes before I could convince him to calm down and head into school. I was worried that he'd chicken out and I wouldn't be able to get him to the play. Last night, I was pleased that he pulled out his script and asked me to rehearse with him, reciting the lines of the damsels and singing the group numbers with him. Things were looking up. Tonight was the night. I had no trouble getting him out the door. He didn't seem nervous at all. We got there plenty early and the doors weren't even unlocked yet. I was impressed at how he knew not only his lines, but everyone else's. I could see him mouthing the lines as the other people spoke. He sang passionately and I was impressed. Afterwards, my little knight and I went out for a burger and milkshake. I always cherish those moments when I can give one of the five boys undivided attention. This one always eats it up. I was so proud to see him sing so confidently and enjoy himself. I hope he doesn't lose that and than I'm able to see him up on stage many more times. Tonight my son's little league took the title of "Little League Pee Wee World Series Champions." Pretty exciting for a bunch of 7 and 8-year-olds. And plenty exciting for their parents. This season I felt a little out of the loop. I hadn't attended many practices since his 6-year-old brother was playing t-ball this year. And for t-ball, they had a pretty rigorous schedule. Practice two nights a week, sometimes three. They'd start at 5:30. Sometimes they'd go to 6:45, but most often 'til 7 and sometimes it was 7:10 or 7:15 by the time they'd wrap up. But the kids didn't complain. The coaches enjoyed it. So, I was often there with the youngest boy and only made it to a couple of his big brother's practices. I missed several games for the same reason. I was at baseball with the little one while my husband was at baseball with the older one. Truth be told, my older son wasn't that enthusiastic about playing. At sign-up time, he was all excited about having his good friend as a teammate. A couple weeks into the season and the novelty had worn off. Last year he had played soccer rather than baseball and I think it suited him a little better. He's a very active kid who drifts off when situated in the outfield. A couple times he claimed to have a headache or a stomachache and then as soon as I gave in and let him stay home from practice, he magically was cured. He didn't put in the effort I know he could have. By the time the season ended, he was getting into it and enjoying it more. He was getting dressed in his uniform an hour before we had to leave. I thought it was cool when they won their division title. Then when they won the playoff game, it was even cooler. And it was cooler yet when they won the next playoff game and advanced to the championship. The last playoff game was a nail biter. I arrived a little after the game started to learn that they were down 2 -1. Then they came back and had a 4-2 lead. Then the other team scored 3 and we were down 5-4. Then we got two more runs to win it in the bottom of the final inning. The championship game was also exciting. Our team pitched a shut-out. One of our pitchers also hit a home run -- the only run of the game. The boys were so excited to win. They celebrated with cans of silly string - and covered the coach in it. The coach had his two stepsons as helpers. He is such a patient and easy going guy. I like when a guy like that can lead a team to be successful. It's much more pleasant than a hot-headed screaming and berating coach. Once in a while you come across one of those and they are positive that their approach works. But hey, I'm not a coach. I'm not an athlete, so who am I to judge. Anyway, it was quite a game and will be quite a memory for the boys on the team. Of my five boys, the four older ones have all played on a championship team at some point. Some contributed more than the others. I'm glad they've all had that experience, though. My youngest will move up to the Pee Wee League next year and hopefully he'll be able to have that experience at some point as well. Today we went on one of our annual summer outings - blueberry picking. We've been to many farms over the years to pick many different items -- strawberries, blueberries, raspberries, apples, pickles, beans, pumpkins. I love blueberry picking because the bushes are the right height for both kids and adults to pick. Not like strawberries where the kids can reach right out for them, but the grown-ups get a backache from bending over and not like apple picking where kids can't reach most of the ripe fruit. We usually go to Stateline Blueberries. We've gone there for several years and always enjoy ourselves. This year we missed a turn and came across another blueberry farm in our search. This one is called Blueberries of Indiana (http://www.blueberriesofindiana.com/) So, we decided to pull in and try out a new place. It was a hot day for it - 95 degrees as we were heading out to pick at 3:00 p.m., but we enjoyed it. The goal was 10 pounds. We picked 9.9 pounds in 43 minutes. And some were the size of quarters. (That's a quarter under the one in the photo below! Ok, just a short post to report that I am still keeping up with that new year's resolution: Pitch a bag a week for 52 weeks. It's now week 28. In my last entry, I admitted that I'd fallen off the wagon for a bit, but preparing for a garage sale got me caught up. Since that garage sale, I've spent the past couple weeks trying to reduce the paperwork. I've got lots of school papers from the year to clear out, a magazine rack to go through and files to empty. So, I'm on bag #3 full of paper for recycling. And I've probably got another whole bag to shred. Next week I think it's time to revisit the clothes. I never fully retrieved the summer clothing. I got to some of it, but I know there are lots more summer outfits for my boys that are in rubbermaid containers in the garage. I've got to get moving on that before it's fall again! And in the process, I'll weed out some more clothes. My youngest had a big growth spurt this spring, so I'm sure there's a lot he's outgrown! Yesterday was just one of those days I felt happy. I looked at everything around me and felt good about the world and about where I am. My hubby is on vacation this week. It's nice to have him at home. Things are more relaxed and mellow. I didn't plan any travel this week. We're just hanging around the house catching up on stuff. I got up yesterday to get two of the boys to their summer classes. We had one extra kid here who had spent the night. He was asleep in a sleeping bag on the living room floor. The dog was walking around him. We were clinking dishes around in the kitchen. He didn't move. Don't you wish you could sleep that soundly? LOL! Got me thinking how my boys have such nice friends. The night before, my 17-year-old's friend stopped by. I was scrambling to get an article in for deadline and asked my oldest son to throw some hot dogs on the grill. He's never really thrilled about cooking. His friend took over and stood at the grill making hot dogs and hamburgers and then served them to my younger kids. Later in the morning I knew I had to run some errands. One was grocery shopping. It's a chore I really enjoyed when we were first married. Now, not so much. So, off I went with my list and my recycled grocery bags. I got way more than what was on my list. I spent way more than I planned. That always happens. It is kind of funny to see people's eyes pop out of their heads at the sight of my overflowing cart. Then when I tell them I have five growing boys at home, they understand. Yesterday, I got to the check-out line to see only one lane open. I always feel bad for the people in line behind me. I had been chatting with one lady in the frozen food. She got behind me with her four items. I waved her around me. Then I saw a little girl from my kids' school and talked to her for a minute. Her mom doesn't speak English so the little girl translated. I told her to go around me in line. Her mom also had three other little girls with her. I remember the days of standing in line at the grocery store and trying to keep your young kids quiet. These days I usually go solo when I shop for groceries just so I can concentrate on my list and my coupons and avoid the whole "Mom, can I get these cookies?" "Mom, will you buy cupcakes?" "Mom, can I get a matchbox car?" I do let my "helper" pick one item as we shop. It can be doughnuts or a candy bar or pack of markers. It's their choice, but they have to help put the groceries up on the conveyor and carry them into the house to earn their prize. So, back to my trip to the store. The next guy to get in line behind me was a middle-aged guy with nothing but a gallon of milk. I told him to go around. He tried to be polite and decline, but I could tell he was thinking "I'll be here for an hour to get a gallon of milk if I don't step ahead." I insisted he go first. After he went around, I started to empty my cart. Up behind me came an elderly lady with about a dozen things in her cart. I apologized for the huge cart full I had. "It's okay, honey," she replied. "I'm not in a hurry." Then she started pulling things out of my cart and putting them up on the counter. I thought it was incredibly sweet. She talked as she helped me unload my items -- about how teenage boys eat, about the price of groceries, about how good the blueberries looked. When we were done with my cart, we unloaded hers together. I get goosebumps thinking about it. People can be so kind. Sometimes we see lots of the bad stuff in humanity, but little moments like the ones with the old lady in the grocery store just make me smile and think about how good it all is. I was shopping at Aldi, where you have to bag everything yourself and she offered to help me bag up my groceries, too. I thanked her, but told her I was fine. It feels good to connect with another person, especially someone as sweet as her - even if it's just for five minutes in the line at the grocery store. Then as I was bagging another lady set her stuff out on the counter. I apologized for taking up so much room. She looked at me and asked if I was "the lady from the paper." I told her I do write for the local paper. I have to admit, I still get kind of giddy inside when people recognize me from the paper -- although the photo of me that they print is AWFUL. Then again, I always hate my pictures and probably wouldn't approve of any snapshot. It's nice to hear people tell me that they read my columns and articles and enjoy them -- except the guy who once told me "I read your stuff in the paper." To which I replied, "Oh, thank you." To which he replied "I just said I read it. I didn't say I liked it." He said it with a straight face. No sign that he might be joking. I was a little crushed. I always heed my mothers words that if you can't say something nice, don't say anything at all. I guess his mother didn't teach him that. Here it is probably five years later and that still bothers me. Oh, well. The lady and I chatted. She moaned a little about being a stay-at-home mom and how much work it is. I sympathized. So, I left the store feeling happy. Just happy about encountering such nice people. The afternoon was spent at home with the kids and doing a little work. The kids played with the sprinkler. We ate ice cream. Just a leisurely afternoon. That evening I decided to go to church. It's been a while since I was there. I've been working a lot of Sundays. And I ran into the pastor last week while I was running errands. I told him I'd been working a lot of Sundays. He reminded me about the Wednesday evening service. I decided to head out for the Wednesday service, stopping on the way at the local farmer's market for my favorite bread. The service was a repeat of last Sunday, which was on July 3, so it had a patriotic theme. Patriotic music can reduce me to a sobbing, sentimental mess in no time. We opened by standing and singing the Star Spangled Banner followed by reciting the Pledge of Allegiance. It felt a little weird. Most often I'm singing the Star Spangled Banner at a ballgame and reciting the pledge in a classroom. I kept my composure, but did have to wipe my eyes a couple times. In the sermon, the pastor talked about our troops. His son has done at least two tours overseas, most recently in Afghanistan. I thought about all the troops who weren't celebrating the holiday with their loved ones. We later sang America the Beautiful and ended with God Bless America. It was uplifting ending to a joyful day. The family and I paid a visit to Ribfest in Naperville of the 4th of July holiday weekend. We've fallen in love with such festivals, first attending one in Minneapolis. One great thing about the annual Ribfest in Naperville is that kids 11 and under are free. Once you're in, there's a family area full of inflatables and fun activities and shows that is included with admission. We got there in the afternoon since it happened to be the day of my youngest son's last t-ball game, followed by a team picnic. We first went straight for the food, sampling some ribs and chicken. Then it was over to the family area, where the kids jumped and jousted. The went from one thing to another and repeated and repeated and repeated. Next thing I knew we'd been in the family area for over 3 hours. I wish I had an inflatable jousting ring in my back yard. It would entertain them for hours. I even got in on it and had some fun in the ring. However, the most fun was the mechanical bull. And I even tried it. Oh, yes I did. I have to admit, though. It wasn't pretty. It took me longer to get on it than it did to ride it. LOL! Notice the guy in front of me with the camera. I'm afraid to google "fat chick rides mechanical bull" because there may be video of me out there. Who did the best? My 7-year-old. He rode it out and never fell off. Oh, and the ribs were good, too. It was a good day. But just one thing to add. I have major port-a-pottyphobia. Can you say ewww?????? ﻿The vet pictured above made me tear up. He's a Pearl Harbor survivor. This year marks 70 years since the attack on Pearl Harbor. But, let me tell ya, this year it was a hot one! There were no shady spots to sit and watch. I forgot my sunblock. I forgot the chairs, which meant I was sitting on hot pavement. However, I'm just glad I wasn't one of these people. I suspect they were a bit hotter than me. Ok, earlier this year I posted about a new year's resolution that some local radio disc jockeys had made that inspired me. They resolved to cut down on clutter by getting rid of a bag a week for 52 weeks. Well, as often happens with those resolutions, I fell of the wagon around late March. I think I left off around week 14, so yes I'm a bit behind. However, I'm going to let myself off the hook. I did skip about 12 weeks, but last week I saw my sister and passed on three bags of boy clothing to her. Then we had a garage sale last week and what we got rid of would have easily filled at least another dozen bags. Actually as far as profit, it was probably our least successful garage sale, but it did help us clear out a lot of stuff we were no longer using. I caved and brought a muffin pan and a pair of shoes back in the house, but the rest of it got donated. So, we are at week 26. Half way through the year. I'm going to get back on track here and try to keep up with blogging on my progress. How many of you are still following through with your resolutions? Anyone? Well, it's been 2 1/2 weeks since the kids got out of school. That first week we chilled by sleeping in and then did some days at the library, the movies, trips to the park, trips for ice cream, pool visits. Then the following Monday was the start of summer enrichment, so I had to put the travel plans on hold until they finish that in a couple weeks. They seem to be enjoying it, so I'm happy I enrolled them. Little League season is coming to a close. One finishes up his t-ball season tomorrow and his big brother's team placed first in his division and will have playoffs next week. So, as far as the mom stuff, it's going smoothly and I look forward to a fun month ahead with the boys. As far as me, things are getting really exciting. Last week I got to view the cover image of my new book, titled Mom Moments: a compilation of columns from the Northwest Indiana Times. The book is just what the title suggests, a collection of the columns I've written for the paper over ten years. It was fun putting it together and pulling out my favorite columns to include. The cover image was shot by my friend, MaryBeth Witulski. I love it! Pre-orders are being taken and it should be released shortly. I can't wait. Here's the link, if you're interested in pre-ordering -- and use code DISCOUNT20 for 20 percent off -- http://www.publishamerica.net/product42806.html. Also, take a look at my Facebook page for Mom Moments - http://www.facebook.com/mobileprotection#!/pages/Mom-Moments/313529082299 and "like" it. I post my Times columns on there and will put updates on when the book is released and any book signings I'll be doing. I also have a children's book in the works. Last night I got an e-mail with a look at the final illustrations. Even if I only sell three copies, it's a dream come true to have a children's book completed. It's been on my to-do list since I started writing. I'm so glad to be able to have the project almost finished. It's based on a true story of an event from 10 years ago, so it's taken a while! I'll let you know when it's finally in print. This week was also busy at my other job. Last fall I started working part-time as a photographer in the nursery at some local hospitals. It is such a fun job. Each day I go to work I get to see a new little miracle. I absolutely LOVE being around new babies and new moms. I love capturing these first shots that the families will treasure. We got a new software system this week that is awesome and I was there several days for some training. It has a musical slide show to display pictures and gives us cropping tools that we didn't have before. With anything new, it will take a little bit to get the hang of it, but I'm loving it so far. I'm taking on some extra days while another photographer takes a little time off, but I don't mind. It's so nice to have a job like that -- one that you really look forward to and one that you go to knowing the day will be filled with happy people. Another thing I'm excited about is another blog I'll be writing. I'm not going solo this time, though. My sister, Becky and I are going to be blogging together about one of our favorite topics -- food. We'll post on meals we've had at area eateries, food history, cooking tips, cookbook reviews and more. We just launched our site today, called "Chicago Foodie Sisters." Here's the link - http://chicagofoodiesisters.blogspot.com/2011/07/welcome-to-chicago-foodie-sisters.html. So far, summer is off to an amazing start!